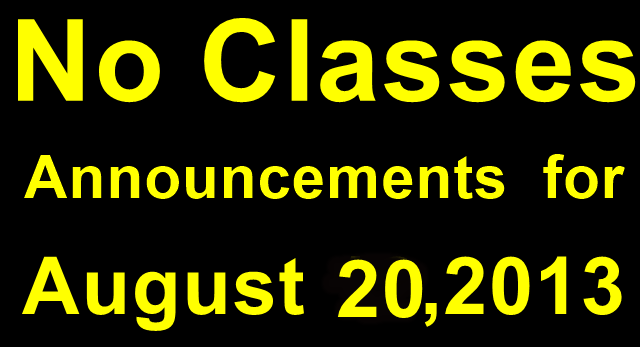 Due to the effects of Tropical Storm Maring and the enhanced southwest monsoon, classes in certain areas have been suspended for August 20, 2013. Please check back on this page for updates. This list was collated from announcements made online by schools and LGUs. For more details on the rules for suspension, please read Executive Order No. 66, s. 2012. This list was last updated on 6:55 a.m., August 20, 2013. For real-time updates from the media and different organizations, please track the #walangpasok hashtag on Twitter. For updates on the weather, please visit http://www.pagasa.dost.gov.ph/. Source: This entry was posted in Briefing Room, Presidential Communications Development and Strategic Planning Office.